We came here, after quitting our jobs and selling all our stuff, to settle for a bit while waiting for our Big Plan to come to fruition. Having been here before we knew that the cost of living here is affordable, the weather is great, and the food is amazing; it wasn’t a hard decision to return! Although we’ve been here two months it is really the last month in Chiang Mai that is a good example of what living here costs. By ‘living’ I mean staying in one place, renting an apartment, and not taking part in all the stuff that we might normally do as newbies to the area. That’s why we wanted to settle in a bit and so chose a familiar place; if we had gone somewhere completely new then the desire to see, and do, more could quickly overwhelm our meagre budget. Totally boring expense spreadsheet. Fascinating, eh? Whenever we travel we keep a detailed account of what we’re spending. We used to use a small notebook to meticulously record every expense and then input it into a spreadsheet but we’ve since discovered the Trail Wallet; a nifty app that allows us to do way with the notebook as we can track, and categorize, every expense right in our phone. Anyway, it doesn’t matter how you do it, the point is that keeping track is essential. We track the following categories and put all the data into a spreadsheet so we can look at trends, annotate large or uncommon expenses, and see where we’re at at a glance. Food & Drink. This is all groceries, meals eaten out, snacks on the bus, beers, bags of ice and bottles of whiskey. We don’t separate out ‘in home’ costs to ‘eating out’ costs or have a separate category for alcohol (that would be inviting unneeded introspection!). Accommodation. For the apartment it’s a one time monthly cost but if we’re staying somewhere just for a night or two we’ll track the cost per night. Transportation. Buses, trains, planes, taxis, moto-scooter rental, songthaews etc. If it gets us from point A to point B it goes in here. Entertainment. Movies, temple fees, TV shows, trivia night fees etc. If we’re out having fun and it’s costing money we track it here. Miscellaneous. Everything else. Usually all of these entries are annotated so we know what they are. Laundry, haircut, postage stamps, camera repair etc. I think this was a really good, representative month for living here in Chiang Mai. We found an apartment we love, were able to partake in all the activities we wanted, and pretty much stayed in the budget we had set for ourselves. Yay! Our goal budget? $1500/month for both of us, or about $50/day. Our actual budget? $1717.48 for the month, or $61.34/day. The difference comes to two outstanding costs that I’ll discuss below. Food & Drink. $751.92/month, or $26.85/day. We have coffee and breakfast at home every morning. We visit the grocery store every few days to stock up on fruit, yoghurt, muesli, and coffee etc an are able to start our days in peace and quiet. We eat lunch and dinner out every day; usually one meal is a quick noodle soup of some sort (about $1/bowl) and one meal is a bit more substantial, probably in more of a restaurant setting, and usually includes beer (around $14 for the two of us). Usually what happens is we have a few really cheap days of eating at the market or at the street stalls (which are all amazing!) and then we’ll splurge and try a new sit-down type place which usually costs more. We seem to be eating Western food about twice a month (this month was sandwiches and pizza) so those costs aren’t too high. We do like our beer though and, although we don’t track that expense separately, I can say that our costs in this category would be less if we didn’t. Accommodation. $516/month, or $18.39/day. We found a beautiful, new, studio apartment in the northwest of the city (outside of the old city). It’s costing us $400/month + $33/month for weekly cleaning + $16/month for wifi + $7/month for water + $60/month for electricity (which would be less but we spend a lot of time inside and have the AC on a lot as it is hot season). You could definitely find cheaper and you could certainly spend more but we love where we are, enjoy spending time in the apartment and feel it’s worth the cost. Transportation. $140.16/month, or $5.01/day. We rent a moto-scooter by the month for $100 (about $3.50/day) and, although we may not use it every day, I love having it. We are able to get out to the lake and run, or scoot into town, or explore other areas freely. It is totally worth it. We sometimes take a songthaew into town if we want to have a drink and not worry about driving; it’s cheap (about $1/person each way) but it would add up if we had to use it all the time. This month we also took a taxi across town when we ‘moved’ so that adds to the expense and don’t forget gas too; it all counts! Miscellaneous. $292.83, or $10.46/day. WHAT HAPPENED? This category is for incidentals that don’t fit anywhere else. Laundry, stamps, my weekly foot massage, birthday gifts, haircuts etc. It should really be much less than this but a couple of things came up this month. First off the LCD screen on the back of my big camera broke and needed repairing (to the tune of $75) and then I needed some documents shipped to me from home as I absolutely had to sign the originals and submit them; it was super important that they get to me in a timely fashion so we swallowed the $80 shipping fee and had them sent. It will make a difference in the long term as these were financial documents so it was worth it. It teaches a good lesson though about travel and budget; always have room for these unexpected expenses. We got hit with two in one month but you never know what’s going to happen and when you might need to cough up a bit more than you expected. I would say that our monthly spending is within our expectations. Although we are $217 over the $1500 we thought it would cost it is those two unexpected costs that put us over. Without those our monthly cost is $1559. 81 -> close enough for me! I expect things to be about the same this coming month; we don’t have any apartment startup costs (we had to buy dishes etc here) this month and hopefully won’t have any unexpected expensive items but we are doing a 4 day trip to the border which will increase our accommodation and gas costs plus border fees etc. It’s certainly doable though. Many people live here for much less and others for more. We like our budget and what it allows us to do and are glad that we can afford to do it. It’s the beer Dalene ;) Honestly though, it does make a difference. I think that, given the lifestyle we have, the budget is reasonable. There certainly are people doing it for a lot less (who are probably picking their chins up off the floor at how much we spend) but, for us, it works. It is what I expected when I talked to people before coming here. I have been avoiding trying to budget an average daily goal for our travels. REALLY avoiding it, but I do want to get an idea of what we’ll need. What are private rooms approximately going for? Nothing fancy, just a simple room with just one bed for two. Carmel, we’re road tripping next week and I booked two rooms each for 500 baht (about $16) per night. We always have a private room with AC and a private bathroom. A fan room is usually at least 100 baht less and sharing a bathroom probably another 100 baht off. 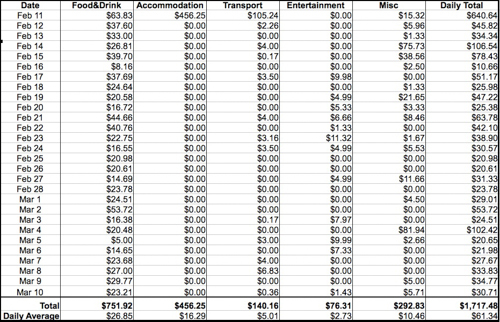 For our RTW trip we budgeted $100/day (for the two of us) and just made it – some places cost more and others cost less. Here we’re shooting for $50/day. What’s Kim of So-Many-Places.com budgeting? She would be a great resource. The great thing about Chiang Mai is that if you decide to spend a bit more you can have a really great lifestyle. I mean, where else can you rent a nice apartment and scooter, eat out twice a day and drink beers for that amount? Glad you are enjoying the city! As always, I love your budget updates as they are so thorough and transparent. I have to be honest, Thailand has been more expensive than we expected, though we probably started in the most pricey part of it… With transport & activities, we have been hard pressed to get in at under $80USD per day. True we were renting private bungalows in the islands, but if you actually want to DO things rather than sit at home and cook every meal yourself, it costs money! I am hoping that when we return and tackle northern thailand that our costs will drop a bit! That was more than I thought too. You guys should come to India, it’s cheaper! But this is good to know considering we’d like to settle down in Thailand for awhile at some point. Thanks for sharing Gillian. Thanks for sharing Gillian, as you pointed out on Facebook, the expenses look similar to ours. Hadn’t come across your site before, but I’m bookmarking it now, keep up the great work! Thanks, Gillian! I love posts like this that let me know what to expect in various places around the world. I have been wondering what the costs in Thailand would be like, comparing them to India – and now I know! Thailand seems to be a little more expensive (I wouldn’t have guessed that), but very budget friendly all the same! TrailWallet looks like a cool app as well for when on the road, going to check it out!